Western blot analysis of extracts from various cell lines using ALDH1A2 Antibody (upper) and β-Actin (D6A8) Rabbit mAb #8457 (lower). The relative expression of ALDH1A2 among cell lines was confirmed by mass spectrometry. Immunoprecipitation of ALDH1A2 from K-562 cell extracts. Lane 1 is 10% input, lane 2 is Normal Rabbit IgG #2729, and lane 3 is ALDH1A2 Antibody. 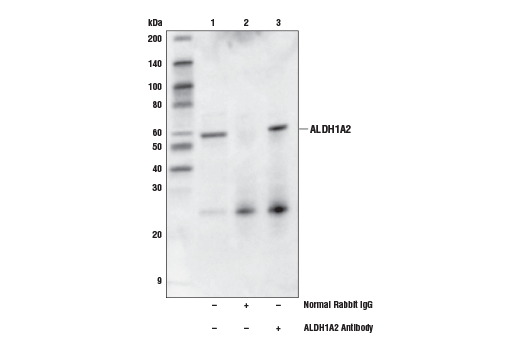 Western blot analysis was performed using ALDH1A2 Antibody. Mouse Anti-rabbit IgG (Conformation Specific) (L27A9) mAb (HRP Conjugate) #5127 was used as the secondary antibody. 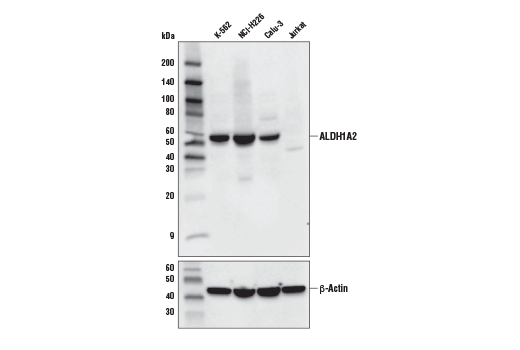 ALDH1A2 Antibody recognizes endogenous levels of total ALDH1A2 protein. Based on sequence comparisons, the antibody is not predicted to cross-react with ALDH1A1. Polyclonal antibodies are produced by immunizing animals with a synthetic peptide corresponding to residues surrounding Gly350 of human ALDH1A2 protein. Antibodies are purified by protein A and peptide affinity chromatography. The aldehyde dehydrogenase family is a large group of enzymes that catalyze the oxidization of aldehydes into carboxylic acids (1). Aldehyde Dehydrogenase 1A2 (ALDH1A2, RALHD2) is among a group of aldehyde dehydrogenases that catalyze the metabolism of retinaldehyde into retinoic acid (RA), which plays a critically important signaling role in animal development (2). Research studies have shown that ALDH1A2 also plays a role postnatally in modulating the effects of RA signaling on immune cell function (3-5). In one example using a genetic mouse model, it was shown that ALDH1A2-dependent RA signaling was a downstream mediator of NOTCH-dependent T cell differentiation (6). Means, A.L. and Gudas, L.J. (1995) Annu Rev Biochem 64, 201-33. Dalmas, E. et al. (2017) Immunity 47, 928-942.e7. Shiokawa, A. et al. (2017) Immunology 152, 52-64. Yokota-Nakatsuma, A. et al. (2016) Sci Rep 6, 37914. Zaman, T.S. et al. (2017) J Immunol 199, 1989-1997.